SINCE the All Progressives Congress, APCs Gboyega Oyetola won the Osun governorship election of September 22 and 27 last year, the false impression has been given by the PDP and its collaborating section of the media that the election was rigged. This falsehood was again re-echoed by former President Olusegun Obasanjo in his petulant and ill-motivated public letter of recent. Obasanjo referenced the Osun governorship election to further discredit INEC and cast a pall of illegitimacy on the coming general election. Obasanjo wrote: I personally have serious doubt about the present INECs integrity, impartiality and competence to conduct a fair, free and credible election. And if the INEC is willing, will the ruling party and government allow it? From what we saw and knew about Osun state gubernatorial election, what was conclusive was declared inconclusive despite all advice to the contrary. Osun has been the fall guy for anyone attacking INEC. Their arguments have been on two strands. First: after the PDP had gathered the most plural votes on September 22, its candidate, Ademola Adeleke, should have been declared winner, making the supplementary election of September 27 unnecessary. Two: the September 27th supplementary election was rigged in favour of the APC candidate. Both positions are false, uninformed and mischievous. Obasanjo and those referencing the Osun election were not in Osun during the election. They no doubt picked up their information from the PDP spin machines falsehood about the election. They are however, partisans of the PDP who would rather discount the election and psychologically assuage their loss and redeem their image before the public. They are also indirectly using the tactics to play the victim and blackmail the election petition tribunal trying the case into giving them a favourable verdict. There are three weighty issues with the September 22 election which cannot be overlooked. The first is that the September 22 election was not free and fair in Ede, Iwo and Ile-Ife where natives were on the ballot, contrary to popular perception. The votes recorded for PDP, ADP and SDP respectively were deliberately bloated through intimidation of voters, multiple voting and manipulation of the voting process by these parties. These results were not genuine. INEC was overwhelmed through violence and compromise in these places. This is not to consider that huge sums of money, including foreign currencies, were being given to voters by a political party physically and electronically two weeks before the election, particular on September 22. Secondly, in spite of all these, it was APC that would have led in that election, and not PDP, if the votes cancelled in seven polling units where rerun were held had been upheld. Except for one or two polling station where election did not hold at all, elections were held in others, votes counted, and results declared, signed by INEC and security agencies, observers and the parties present. 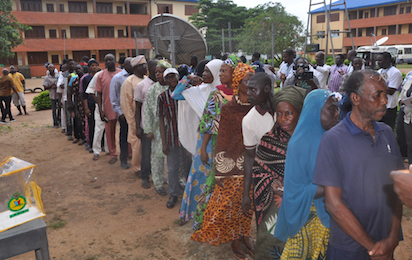 In the polling station at Alekuwodo in Osogbo, for instance, after results have been publicly declared with APC in an overwhelming win, INEC official at the polling unit, in collusion with a party leader who was later arrested and arraigned by the police, ran away with the result, instead of going to the collation centre. INEC refused to accept the signed copies from other parties and security agencies, insisting that it would only accept the copy from its agent that had gone rogue and vanished into thin air. Adding these results, APC clearly won by 58 votes and a rerun would not have been necessary truly. But INEC decided to cancel these results due to reasons best known to it. APC must be ruing its decision not to make noise, protest this injustice and proceed to the court to compel INEC to declare its candidate the winner. Though it is doubtful if these measures would have achieved much, it nevertheless would have roused the consciousness of the public and registered its case in their minds before and after the rerun. The claim of being a democratic party and seeing election as a process that must be allowed to run its full course cost it very dearly in the court of public opinion. With APCs passivity and PDP distorting the narrative, the moral burden of losing the election passed on its shoulders, therefore suffering the double jeopardy of being unjustly denied its victory and being blamed for it as well. The case for a supplementary election is clearly stated in the election guidelines which states that where the number of voters in a place where elections were cancelled is more than the margin of lead, a supplementary election should be held in the precincts where the votes were cancelled. This is to prevent the disenfranchisement of the registered voters. It is an inclusive arrangement to make every vote count and give every voter the right and opportunity to participate in an election. There were three clear precedents on this. Lastly, for those who do not know, but have joined the PDP victim-lamentation chorus, no rigging took place on August 27. Rather, measures were taken by the security agencies to prevent rigging. This is what galled those who thought they had perfected a rigging plot, to replicate what they did on the 22nd and claim tainted victory. Acting on credible intelligence, security agencies swooped on mercenary voters and thugs parading as observers camped at a popular hotel owned by stalwart in Osogbo, a university campus not far from Osogbo and a hideout in Ile-Ife. They were about being unleashed on the polling units from their hideouts when they were busted by law enforcement agents. They all had in their possession fake INEC observers gears like accreditation cards, reflective jackets, face caps and others. The police paraded 16 such elements to the public after they were arrested and their plot busted. These sting operations took place far from the voting areas and had no impact on the election. I insist no genuine voter was prevented from voting. I am therefore asking anyone who had a valid voters card and was prevented from voting in the supplementary election of September 27th to challenge my claim. APC won the rerun because the seven polling units were its strongholds ab initio and had won in the respective local governments they were situated. At any rate, the matter is before the tribunal and as the facts and revelations keep tumbling out, the truth will triumph over falsehood in the end.